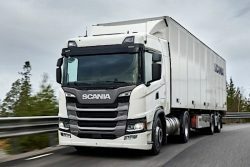 The Scania truck, propelled by the new 410 hp natural gas engine, has been chosen as the 2019 Ecological Industrial Vehicle in Spain by a jury of almost fifty businessmen and alternative energy specialists. The 410 hp engine, launched just over a year ago, is Scania’s most powerful natural gas engine. 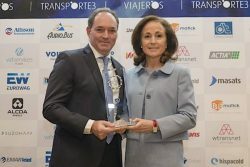 The prize is part of the National Transport Awards organized by the journals Transporte 3 and Viajeros (Grupo Editec) since 1988 and annually awarded by a group of businessmen and professionals from the freight and passenger transport sectors of all the autonomous communities. The award for Ecological Industrial Vehicle has been granted by a jury composed of 32 members who evaluated 14 applications. The delivery ceremony was held at an event attended by more than 500 personalities from the transport sector, both merchandise and passengers. It is the most powerful gas engine of the brand with a maximum torque of 2,000 Nm. It is purpose-designed to you to carry out long distance transport efficiently and profitably, thanks also to an autonomy that can reach up to 1,100 km with LNG (Liquefied Natural Gas). This engine allows a reduction of CO2 emissions of up to 15% with natural gas and up to 90% in the case of biogas. It is suitable for sensitive urban environments, since it has ECO label and can access urban areas even in episodes of restrictions due to high pollution, also with reduced sound emissions.